B. Thomas (Arlington, Texas, United States) on 9 March 2011 in Landscape & Rural and Portfolio. I have no idea why this rock was so red, but it appeared to be at the end of the rainbow on a rainy July evening in Glacier NP. ...or start! Beautiful shot in excellent compo! Niiiiiice! did you hike over to find that pot of gold? i thought it was supposed to be a pot of gold? and you only found this red rock? tsk tsk.. wonderful moment in nature! I had the same question as the others from the pot of gold. The moisture in the air saturated all of the scene ... it is gorgeous! ha ha . . looks like Fool's Gold, to me ! . . wow, this all looks so humid. A wonderful image. The rainbow alone is great but the red rock really adds a lot of interest. @Candais: It was a strange rock. fantastiqe3u arc-en-ciel, très bien capté et mis en évidence mave cle vert de la forêt superbe. What fun! Rainbows are such a miracle. That's a happy magical picture. Good Lord!! It looks like someone just plunked it down there, doesn't it? :-) Kinda cool, really. 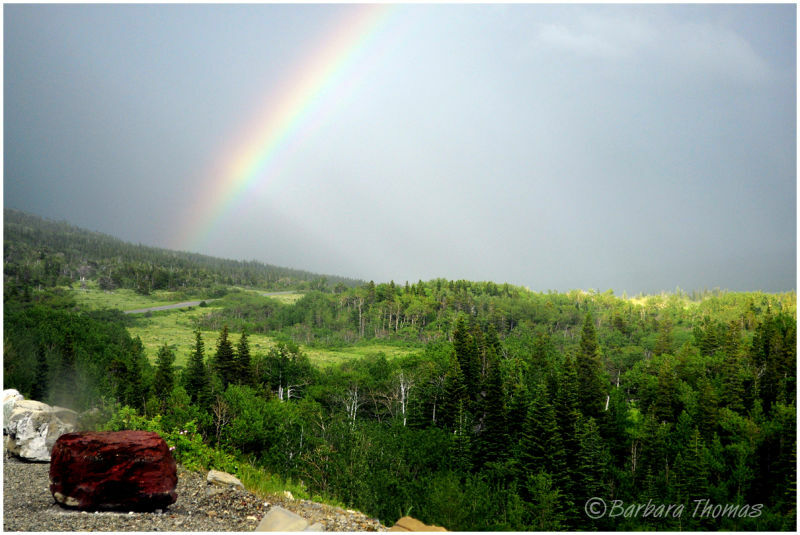 This is a fantastic rainbow capture, Barbara, the sky is perfect too for this image. I love those evergreens!! Very nice job here good friend! @Denny Jump Photo: Thanks, Denny. It was a perfect place to be right then. Beautiful composition! Superb light and colors! beautiful landscape and title! such a rainbow is a so special theme and so difficult to capture! Love rainbows..a fine capture...nice colors..